Set the time zones for your reports and campaign data within your "Edit Campaign" settings. Different time zones can be specified for each of your campaigns. 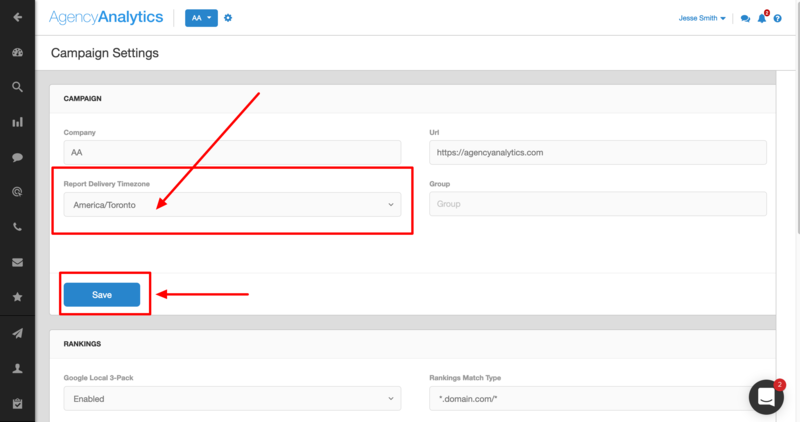 In addition to impacting the way that data is displayed within your integrations, this settings also affects the time your reports will be sent, ensuring your clients receive their reports at the right time, regardless of where they are in the world. To change your campaign's timezone settings, click the "gear" icon at the top of a campaign, and choose "Edit Campaign". Next, choose your client's timezone in the "Report Delivery Timezone" drop down, and then click "Save".